GoodReads Summary: Fourteen-year-old Hattie Moore doesn't actually know who her father is - but that's the least of her problems. How ca she become a TOTAL HOTNESS GODDESS when Miss Gorgeous Knickers at school hates her and no one fancies her because she has no breast? And her family are an actual nightmare. Her unbelievably annoying brother is EVIL and on top of that, her gran is a TOTAL mental who may be texting rude jokes to just about EVERYONE in the world. Including her dentist. Hattie's diary of this tumultuous year is an absolutely hilarious account of the ups and downs of teenage life including a dating bogey phobia, near death from biscotti and a home-made breast-growing machine. A fun and frothy read littered with British humour! When I received this for review my first thought was 'Oh, what a cute cover!' and then I read the blurb and thought "hmm, sounds a bit young for me" but despite this I decided to give it a go. 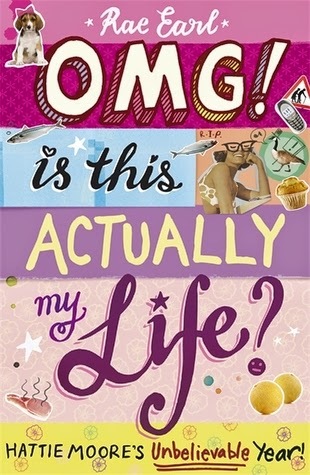 Sometimes I need a book that can just make me laugh, and OMG! Is This Actually My Life? is exactly that book. Written in diary format it follows the ups and down of 14 year old Hattie's life as she goes on a journey of self discovery. OMG! Is This Actually My Life! features a wonderful set of quirky characters. There's Hattie's totally 'mental' nan, her 'evil' brother, and of course her mum and her dad, but the one I think deserves a special mention is Goose "the guy next door". He has a crush on Hattie, but she's completely oblivious to the the way he feels. He was so cute, I just wanted to hug him! I love how Earl incorporates popular culture and British culture/slang into the book. There are references to Primark, Jeremy Kyle, Harry Potter, Eastenders and phrases like 'you doughnut', 'is a total mental', and 'chav' are thrown in too. It just made Hattie all the more relatable when she mentioned things like Facebook, x-factor, and Zumba. OMG! Is This Actually My Life? works great as a stand-alone, but from the way things ended there is plenty of room for a sequel. If there is I'll be over the moon, but if not I'll still be happy as this is a book I know I'll be re-reading! Rae Earl is also the author of My Mad Fat Diary a book (based on her life) that has been turned into a TV show and is currently airing on E4. You know what, I think I might reconsider this! I didn't have the best luck with the other two books Walker send out with this, and like you said, it does sound like it might be quite young, but after your review, I am willing to give it a shot. :) British humour and fun characters - I'm sold. Great review, Renu! LOL! That does sound like a cute book. I would have thought it'd be a bit too young for me as well, but sometimes we need something light and silly. Lovely review! This definitely sounds like a super cute read! I don't normally read books with younger main characters so I won't be reading this one, but still, lovely review! Oh, good! I just received this for review the other day and I knew nothing at all about it. You've made me very excited to read it. Although contemporary is rarely my thing, this sounds like an excellent read. When I read the blurb, I thought the book sounded kind of young. It seems like it's a cute read though. Great review, Renu! I love quirky characters and a story that can make me laugh. Lovely review. I have always been reluctant to read diaries, the only one I have enjoyed is Salmon Fishing in the Yemen from the film. I find them hard to grasp the concept of the book for some reason. But... this sounds like a very fun read that's for sure! And the title actually made me laugh out loud! Haha! :D Lovely review, Renu. Sounds fun! I've seen the ads for My Mad Fat Diary, I'm hoping to see an episode on catch-up...I haven't watched TV in ages. Lovely review, Renu! This sounds really cute and fun! And near death from biscotti? That's hilarious :) Thanks for sharing!